Wire wrapping is the art of twisting, wrapping and generally creating shapes from metal wire (silver wire in the case of jewelry, aluminum, brass or steel wire for decorations). 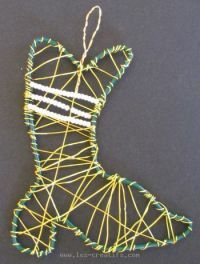 You first have to print out the design to the size you want, then create the design you've chosen, using the green wire: Start at the top of the star, leaving 1.6 inches of wire free. When the wire has gone all the way round the design outline, tie a knot and make a loop from which to hang it. 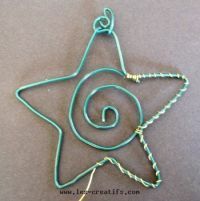 If you can't make the design with one piece of wire, take another piece and fix it to the main piece using the brass wire (as in the "swirl" inside the star). Wrap the brass wire round a spot on the wire design (it can also be used to attach a second piece of wire), wrapping it tightly (it mustn't come undone). 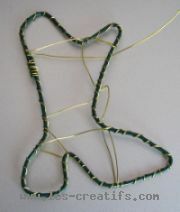 Then wrap the brass wire around the design in a regularly-spaced fashion . 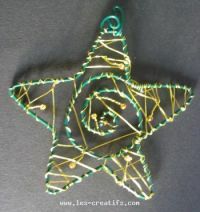 When this stage is over, criss-cross the design with the brass wire, wrapping it regularly round the wire outline of the star. 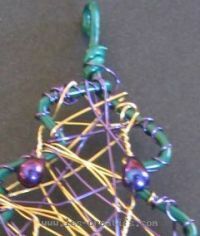 thread on a bead to the brass wire, at a distance of about 0.4 inches from the star, fold back the brass wire and twist it round this 0.4 inch length of wire jutting out from the star, then continue winding the wire around the design. With the Christmas stocking, it's parallel rows of seed beads that are threaded on to mark the stocking's 'turn-up' . 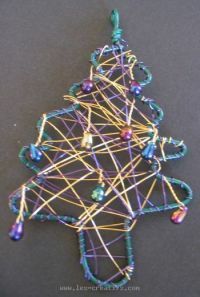 For the Christmas tree, we'll use two colors of brass wire to represent the tinsel on the tree. The irridescent teardrop beads represent, of course, the Christmas balls hanging from the tree.